It is sometimes comforting to know that you have struck a balance in an argument and are able to see the other 2 extremes dispassionately, even though you disagree with both positions to some measure. And when informed public opinion is supportive of your position, your sense of wellbeing is further enhanced. You feel “balanced” at this center of gravity. But in the real world this is easier said than done. Imagine trying to stay balanced in the center of a seesaw. This exercise may be good to strengthen your core but it is not a position you can sustain. Just try it. Now, repeat the exercise by placing 2 “extremists” at the ends of the seesaw. A new balance of power emerges and you feel steadier. In a philosophical sense it is almost as if you need these extremes just to stay centered. 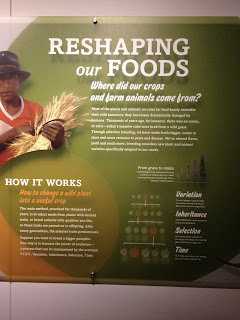 That is exactly the balance the new exhibition “Our Global Kitchen: Food, Nature, Culture” currently running at the American Museum of Natural History in New York is trying to achieve. It takes us on a fascinating and disturbing journey of the world’s oldest and largest industry (agriculture) through a light prism of history, geography, economics, evolution, science, technology and cuisinology. No easy feat. While its grasp may be less than its reach, it highlights issues that are being debated in the public domain across the disciplines mentioned. In so doing, it does not opine or attempt to compromise. Nor does it try to find common ground. But it presents facts and perspectives that make you appreciate the extremes and hopefully carve out your own positions on issues ranging from cultivation, vegetarianism, food preservation, processing, biotechnology and perhaps even GMO. Given the serious social debate on these issues, the timing of this exhibition is uncanny. Here are a few interesting nuggets from the exhibition that will make you wonder, but may or may not change your mind. About 870 million people (one in eight humans) in the world were hungry last year and yet 35% of all crops grown are for animal feeds and not for human consumption. To make it worse, 30% of what is grown for humans does not get eaten due to wastage. What we throw out in the garbage at home is only the last stop in a long global assembly line of value addition from farming, harvesting, transporting, processing, retailing, cooking and finally garbaging. This cumulative waste is a staggering 1.4 billion tons annually. Now lets talk about animal feeds. The story is worse. It takes 29 calories of feed to produce 1 calorie of beef and 20 times as much water to grow beef as growing cereal grains for human food. This is like saying it costs the US treasury $29 to print one dollar? Does that even make sense? In 1895, it is believed the Atlantic Cod was 1.8 metes or “man-sized”. Selective harvesting of these larger fish reduced the size of the cod to 2 feet in 1970s and only 18 inches today or baby sized. A few hundred years ago the jungle fowl used to produce 12 eggs a year. We intervened and today the record production is 364 eggs a day! Through these centuries should we as humans have intervened at all? Or will you argue that our species would not have survived had we not? Is tampering with evolution sacrilegious or will you argue that it too is part of human evolution? Does that permit breaking the species barrier through biotechnology and genetic manipulation? Or will you argue that we cannot afford not to? So who is judging? Monsanto? Pepsi? Stonyfield Farms or Tasty Bite? Or voters for Prop 37 in California for labeling GMOs in foods or New Yorkers for opining on selling oversized sugary drinks in schools? It is true that sometimes a mind is made up and you cannot confuse it with facts however compelling. Your center is often very different from the center of gravity. For now it does not matter what you believe in for it will change and it will evolve. We live in interesting times. Lets hope we don't allow decisiveness to trump facts. Lets strive to magically balance public health, planet health and corporate health.